Daily Listen: Big Star - "Don't Lie To Me"
Did I mention that this week is sorta Blitzen Trapper week. Well it is. With the band releasing American Goldwing, it's time travelling, genre redfining new album just yesterday (read our review here) we figured now would be a great time to take a look back at the band that very clearly have their hooks in the bands DNA. And one of those bands is without a doubt Big Star. Big Star combined MASSIVE guitar hooks with the smart, poignant lyrics of songwriter Alex Chilton to produce what many consider to be THE soundtrack of the 70's. 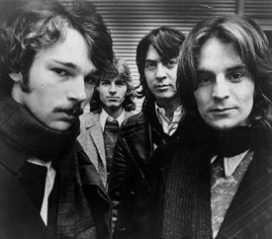 Their music bled cool, and if you're gonna even attempt to capture that Econline vibe that the bulk of popular music form the 70's is known for, then your lessons postively have to begin and end with Big Star. This track off of their album #1 Record, could have been put out by any variety of "retro" bands today, but they would never have been able to capture the off the rails bad assness of the real thing. That is unless you're Blitzen Trapper. Slide this song into any slot on American Goldwing and not only would you be surprised how well it fit, you might be fooled outright as to who is actually perfoming it. That's a testament to the quality of both bands music, and in the end what makes both bands the legends/near legends that they are. Big Star - "Don't Lie To Me"